Hiring a skip is an easy, cost effective way to responsibly and safely dispose of unwanted items, whether you’re having a spring clean, doing some home renovations or clearing out a property after a bereavement. At Skip It, we recycle 95 per cent of the items that customers dispose of in our skips, so you can be confident that your clear-out will not harm the environment. Our skips also come in a variety of sizes. This means that whether you’re clearing out one room or a block of flats, you’ll only pay for the space you need. If access is difficult, our Wait and Load service is always a handy alternative that means you will only pay for the space you use and avoids the need to have a skip sat outside your property as we’ll take everything away in our van. But if you are looking to hire a skip, it pays to know exactly what you cannot put in a skip and make sure you’re working with a company who will help ensure your waste clearance service runs smoothly. At Skip It, we’ll work around you with skip delivery and collection on a day and time that suits – some clear-outs last an hour, some take several weeks to complete – we get it. Here’s the good news. Our skips can be filled with a wide variety of items, including the majority of things that our customers want to throw away. 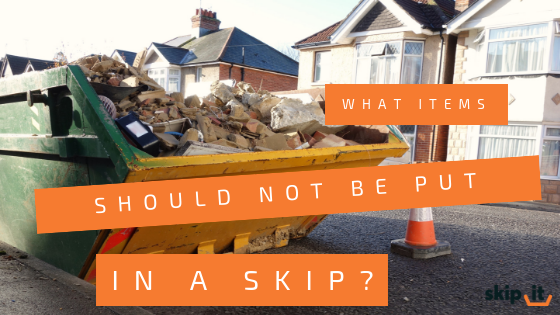 What items shouldn’t be put in a skip? Some items, however, should not be disposed of in a skip, as they can pose a danger to you or those who handle the contents of your skip when it’s emptied. Get in touch to discuss the removal of anything on the following list of prohibited items. We’ll be happy to give you a list of options and prices, allowing you to clear out your clutter in one go. Certain items are considered hazardous, and these should be disposed of at your local council run Household Waste Recycling Centre, if you have transport to get you there. Visit www.gov.uk to find your local site. If you can’t get to a Recycling Centre, we can pick some of these items up for you and dispose of them responsibly on your behalf. This is a highly dangerous material and there are stringent rules in place for its safe disposal. Asbestos should never be mixed with any other type of rubbish and should only be handled by experts. Electrical items like kettles, TVs, fridges and freezers should not be put in skips but can be disposed of safely at your local Household Waste Recycling Centre. If you don’t have transport, we can arrange to take them for you. Some local councils will also pick up large items like fridges and freezers from outside your home. There may be a charge for this service, depending on where you live. It’s worth checking with the original retailer of the item, as some offer a trade-in service and will collect the old item if you buy new from their stock. Full gas cylinders are extremely dangerous and should be disposed of via a specialist company, as they can explode if crushed. Empty gas canisters can often be returned to the original retailer for recycling. Some Recycling Centres will accept both full and empty canisters, but it’s best to call ahead and check. Batteries of all sizes require specialist recycling as they must be broken down into their component parts. Recycle Now has a battery recycling point finder that will help you find somewhere to take spent batteries, in your local area. If you need to dispose of a car battery, try phoning round local garages, as some will recycle these. Medical waste like used syringes or soiled dressings, along with any type of chemical waste, must be handled very carefully. Contact a specialist company to dispose of this type of waste. As well as hazardous waste items, there are some additional types of rubbish that should not be put in your skip. Partial or full tins of paint should not be put in a skip, as paint is a chemical substance that poses a health risk. It’s fine to put completely empty pain cans in your skip. Try getting rid of your remaining paint by offering it to friends and family or adding it on a site like Freegle or Freecycle. Community Repaint is an organisation that will find you a community project looking for paint donations in your area. Some areas also have paint recycling centres. You can also ‘dry up’ paint by adding something absorbent like sawdust, soil or cat litter to the can. Once the paint has solidified, the can should be placed with general household waste. Plasterboard or gypsum waste cannot be placed in a standard household skip as current UK legislation states that it must be separated from general rubbish. If you have a reasonable amount of unused plasterboard, you may be able to give this away to a local plasterer. We can also arrange to collect and dispose of unwanted plasterboard. Please get in touch for a quote. Tyres are notoriously tricky to dispose of, but there are a number of specialist companies in the UK that can recycle them, turning them into things like rubber flooring for playgrounds. Local garages or tyre fitters may also recycle your unwanted tyres. Fluorescent lighting tubes are potentially harmful as they contain gas and should only be disposed of at your local Recycling Centre, or by a specialist company. Mattresses must be disposed of differently to general waste, so an additional charge may be incurred if you’d like to put one in your skip. Get in touch and we’ll give you a range of disposal options, depending on the size of your mattress. Global Recycling Day 2019 – How Can my Business get Involved? The Marie Kondo effect: good for decluttering, bad for the environment?